Trump Gaslights Nation On "Uncontrollable" Arms Race - Joe.My.God. Let’s go back just six weeks, shall we? President Donald Trump told reporters Monday that the United States would increase its nuclear arsenal until other nations “come to their senses,” threatening an arms race days after he said he would withdraw the US from a Cold War nuclear treaty. Trump announced over the weekend that he intended to pull the US out of the Intermediate-Range Nuclear Forces Treaty (INF) with Russia and accused Moscow of violating the deal. The signing of the treaty in 1987 was seen as a watershed moment during the end days of the Cold War, helping to eliminate thousands of land-based missiles with ranges between approximately 300 and 3,400 miles. 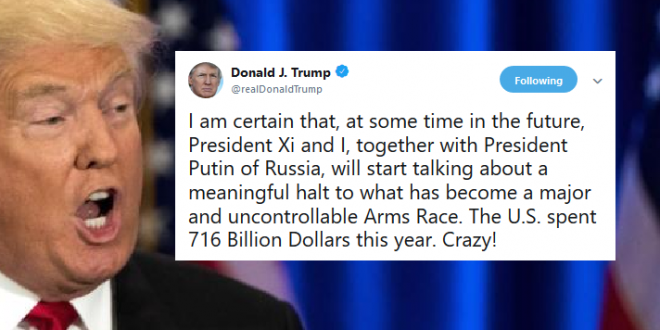 Trump repeated on Monday that Russia had not adhered to the treaty and said his vow to increase the US nuclear stockpile included a posture against China as well. His threat to increase the US nuclear arsenal prompted international concern.